Several ghosts are believed to reside at Fort Ontario, built in 1755. One is British lieutenant Basil Dunbar, who lost a duel here in 1759. His dazed ghost has been seen, seeming not to realize he is dead. Corporal Fykes died of disease here, and his apparition is paired with a sudden cold temperature. A soldier in Civil War blue and a female spirit are said to linger as well, and the sound of a little boy crying and giggling are also heard. And be careful when visiting the Post Cemetery at the fort. According to locals, anyone who walks over the grave of George Fikes (who died in 1782) will be haunted forever. (But if you jump over it, he’ll haunt anyone of your choosing instead.) This little ritual is apparently still practiced, as visitors often remark about the two bare spots of ground on either side of the grave. There is also said to be the ghost of a headless Civil War veteran roaming the railroad tracks between the fort and the lake. I have never been to this place, but, I have seen it on Ghost Hunters on SyFy! And let me tell you something, that is the second most Ghost related thing, that has ever given me the chills, in the last 5 years. I sware to God! The onyl story better than this is the story that my Dad told my Uncle Mike about some guys apparation walking in the trees off some road, if you see that thing, and you look around, and everyones in the car, you’re good. But then you look back, and see the apparation is gone! Look back inside your car, at the Passenger seat, and the apparation should be right there looking back at you!!!! I grew up in oswego and always went to the lake and hing around the fort at night I have heard the little boy that was mentioned and I have seen the man and woman but no one mentioned anything about the sigle lantern light that you would see on the top of the fort walls and then disapearing and suddenly appearing on the grounds below the fort. Tom, If my memory remembers correctly didn’t we actually see the little boy one night when we were walking down there? I grew up in Oswego. Spent many days and nights walking around the Fort and the surrounding areas. One Halloween it was in 1986, a few of my friends and I went down there to the Post Cemetery to see if we could spot any ghosts. We did see the solider with no head walk up the embankment from the lake (Big Rock) to the Fort. Also, about the grave of George Fikes…I had always heard that if you jumped over the grave 13 times that he would appear to you, then make his was to the Fort. Yes many have done it (that is why there are the imprints on the sides of it). The saddest one there is the baby. Not sure who it is. I think that the fireplace has a history as well that is in there, but I do not know the story. as a ghosthunter, ive hunted here and have had meany interesting experiences.some of them range from smelling wood burning from one of the old disused fire places, seeing shadows, smelling gunpowder and hearing voices and footsteps in almost every part of the fort. ive also gotten some voices including children and soldiers on my spirit box or shack hack and captured meany evps on my digital recorders. ive gotten some of my best evps here including the voice of a small child named david, whos one of the most active spirits here. ive gotten david laughing and singing and also got a female crying in quorters one, what sounds like someone dragging furniture on the 3rd floor of quorters one, a little girl lauging,, and even the sound of a cat and someone calling for it. ive never really had any encounters at george fikes grave but i have seen a light that looked like a lantern along the railroad tracks behind the fort. i heard a story that its actually the ghost of a soldier who ended up getting hit by a train one night. ialso during world war 2 the fort was home to jewish refugees who had escaped from germany during the holocost as well. this is a great place to go if you love learning about history and for those who like ghosthunting and haunted places. I live in Sweden and a young girl come in to my dreams she was a goast and she was stuck in a room she tried to get away and I ask her what do you want she said Im been in a car accident red creak Ontario and her head was injured on her right side. She said say to my family I love them and thousend others and something about Paris and Wien. What is this I didnt know that red creek is in Ontario til I get to my computer and saw this. This is very odd she had also a dress in pink thin flowing the girl has long light hair young in 18-20 years old with sweet girl. I have never been on American websites before I dont know nothing about Red creek Ontario eather. If you can send this the message to her family if you know something about any caraccident. I dont think this is funny Im not a medium. Det kan hända ibland. Alla människor är lite synska. When my brother and my girlfriend went to the railroad track behind the fort where there is said to be a soldier who walks those tracks, We felt like there was someone following us and we looked around and there was no one there with us. I think that place is awesome. Approximately late June of 2016 2:30 AM, I and another individual were walking back to my house after a BBQ. We had started to walk up Schuyler Street in Oswego NY near Fort Ontario. We both stopped and turned around as it was late and noticed an unusually dark reflection of headlights which cast a large dark shadow upon 8th street. We were standing on the corner of 7th Street and Schuyler. As the reflection moved away we both observed what could only be described as a shadow person step from the darkness and start crawling across the roadway and scrambling with a crablike crawl up the hillside where the community gardens are. It started to rise up, changed from inky black to a grey color and morph into what looked like a 7 foot tall werewolf with a short staff in one hand and then suddenly dispersed into a mist and disappeared. We both looked at each other and I asked did you see that? Yes. My friend saw it also. Trying to rationalize what we had seen I thought of the 3 clans of Bear, Turtle and Wolf. 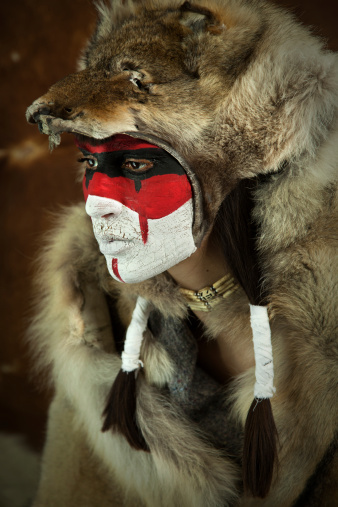 Having looked into the native warriors of this area the wolf headdress, along with the club fit the image we had seen. Another friend at the Community Gardens found that the gardens are approximately in the same place as the original Fort Gardens of long ago. To the best of my knowledge this is the first reported sighting of this ghost in Oswego NY.